Aalto MBA and Executive MBA programs have a great deal in common – and certain clear differences. Katri Koivula and Mikko Laukkanen explain why both are great options, and highlight factors that you should consider when choosing a program that is right for you. There are four main things to consider when deliberating between the Aalto MBA and Executive MBA: the stage of your career, your experience as a leader, the program structure and your overall work experience. The main difference between the programs is who they serve best. The Aalto MBA is the right fit for someone who wants to make a leap in their career and explore new alternatives. If you are looking for a stepping stone that will help you move up on the corporate ladder, or pursue a completely new direction in your professional life, the MBA program fills the bill perfectly. Many Aalto MBA participants work as experts and managers, and they have ambitions of moving on to leadership positions. “If you are for example a lawyer or engineer and you will soon be leading your family business – or you want to become a leader but need to strengthen your business skills before taking that leap – the MBA will give you the tools and capabilities you need to achieve these ambitions,” explains Katri Koivula, Associate Director of the Degree Programs Business Area at Aalto University Executive Education. The EMBA is best suited for established executives who know where they want to go. If you have several years of relevant experience in business leadership and you wish to accelerate or strengthen your current career development – the Executive MBA is the right choice for you. It is impossible to say whether you should choose the MBA or EMBA merely based on how many years of experience you have, says Dr. Mikko Laukkanen (right), Academic Director at Aalto University Executive Education. The essential question is what stage of your career you are at. If you want to become a leader, go for the MBA. If you already are a leader, opt for the EMBA. In general, the contents of the Aalto MBA and EMBA programs are quite similar, covering all key areas of business, elements of personal leadership transformation as well as business and organizational transformation. The key differences between the two programs are the learning experience they offer and program structure. Both programs are divided into modules containing a pre-assignment and take-home assignment. The Aalto MBA has more contact days, group work and teaching hours, while the EMBA requires more self-studying and topics are covered at a faster pace. The MBA has five classroom sessions during one week each month. You will dive into topics thoroughly to gain a comprehensive understanding of business, and specialize in a chosen area of concentration: Applied Finance and Accounting, Entrepreneurship and Innovation, or Renewal and Transformation. Aalto MBA participants can also undertake some of the modules at one of Aalto EE’s top international partner universities. The MBA program broadens your career prospects with a highly hands-on and practical approach, for instance through working with startups to develop their business model and strategy, and thus applying frameworks and tools in practice during the modules. The strategic, leadership and tactical skills you gain during the MBA will enable you to take the next step in your career. While a strategic outlook and leadership are highlighted in both programs, the emphasis on strategy is even more profound in the EMBA program. The EMBA only has three days of teaching each month, with considerable self-studying before and after each module. The EMBA gives you a multidisciplinary perspective on business, and increases your understanding of how you can become a driver of organizational transformation. In short, it prepares you to discuss all business issues more knowledgeable in meetings as a leader, it gives you globally relevant competencies, shows you what analyses you need to ask for, and how results can be utilized to support decision making. In addition, EMBA participants have the possibility to choose elective modules offered in other Aalto EMBA programs and partner schools in various locations. “We have quite many participants who could easily fit into either the MBA or EMBA group based on their career development and leadership experience, but one of the programs is a much better fit due to scheduling or learning preferences. If you, for instance, travel extensively in your job, it may be easier to allocate only three full days a month for in-class studying, as you do in the EMBA,” says Koivula. The formal requirements for the MBA and EMBA programs are not very far from each other. To be eligible to apply to the MBA program you must have three years of relevant work experience, while the EMBA program calls for 5 years of experience. The average age of an MBA participant at Aalto EE is about 35 years and EMBA participants are typically in their early forties. The MBA is a turning point for ambitious professionals. You can integrate full-time work and studies in an agile manner and tailor your own learning path depending on your needs. During the program, you reflect on your own strengths and weaknesses and gain new tools and skills that enable you to move on to a new level of strategic thinking and take on new responsibilities with stronger business and leadership skills. “Learning these traits gives you confidence and credibility, and helps you become a leader with broad perspective,” explains Koivula. The EMBA allows experienced leaders to enhance their already considerable experience and personal growth. During the EMBA you share your insights with your cohort members – all likeminded, established leaders, who all bring a great deal to the discussions. If you are not yet a member of the management team, the program will very likely expedite your advancement to that stage. “The backgrounds and experiences of your fellow participants shape the discussions you have in class. While the contents of both programs are very similar, the EMBA participants reflect on topics from a broader perspective and the vantage point of a seasoned leader,” she adds. Many individuals contemplating studies in the MBA or EMBA program ask Aalto EE personnel which program is better. This is a question with no right or wrong answer. “In general, there is no difference. If you are looking for a new job on the global market, the MBA and EMBA count exactly as much on your CV,” says Laukkanen. “But personal preference naturally plays its part. If your superior is a graduate of the MBA program, he or she may value it more, for example, because it allows you to choose electives and become highly proficient in selected fields. Or perhaps your colleague is an EMBA graduate and you want exactly what she or he got: the new perspective on all areas of business with a special emphasis on strategy and leadership in a global context,” Koivula continues. While there is no difference in the prestige of the MBA and EMBA, there are considerable differences amongst institutions offering these programs. Aalto EE has longstanding experience in world-class business education combined with the best and newest interdisciplinary insights in areas such as digitalization and design thinking. Aalto MBA and EMBA programs have the highly respected Triple Crown Accreditation – AACSB, AMBA and EQUIS. They are the three most respected accreditations available, which have been awarded to only 0.5% of business schools globally. “Our accreditations speak volumes of our high quality and constant development,” Koivula says and reminds that it is equally hard to get accepted into both the Aalto MBA and EMBA. “We attract a very high level of talent and we screen our applicants thoroughly. Our graduation rate is remarkable – 98% – and this is because we only let you in if we wholeheartedly believe you have what it takes. We want you to succeed, and we offer you considerable support throughout your studies. We know the challenges you may face during your studies and we know how to help you through them,” Laukkanen confirms. Often times the EMBA is paid by the participant’s employer, while many MBA participants pay for their studies themselves. However, this is simply a trend, not a rule. Most participants have a bachelor’s or master’s degree prior to starting the MBA or EMBA program, but there are exceptions to this trend as well. “We have had applicants who were professional athletes, or entrepreneurs who founded their own businesses straight after high school. Everybody goes through the same application process. If you show the level of talent and motivation we require from our participants, we make sure we find the right solution for you,” Laukkanen affirms. If you have not studied for a long time, Aalto EE may recommend starting out with one of the shorter programs that offer a pathway to the MBA or EMBA. You can take up to four MBA modules as a visitor together with current MBA participants, or use for example the Aalto EE Global Leader Program as a route to EMBA studies. “This gives you an excellent opportunity to assess your own motivation and ability to study,” Koivula says. “Completing for example one or more Global Leader module before you start your MBA or EMBA journey also eases your workload during the fast-paced MBA or EMBA program,” she adds. The Aalto MBA and EMBA programs both include an extensive self-development program, which is often regarded by alumni as a considerable game changer in both their personal and professional development. “Personal development plays a large role in both programs. The MBA and EMBA give you confidence and certainty that you can discuss all matters relating to business. The studies demystify areas of business such as finance and marketing, and give you the skills and tools to handle business challenges in different contexts,” Laukkanen remarks. “Your strategic thinking will develop considerably. You will know what elements are connected to different business decisions. 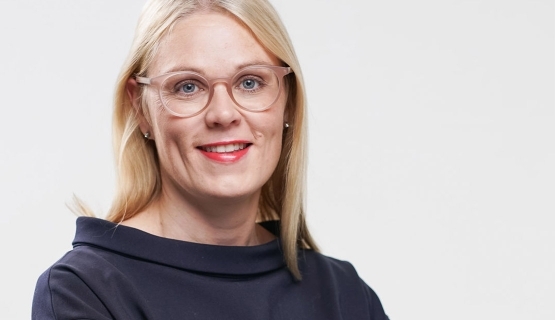 Finance is a good example: you don’t need to understand all the ins and outs, but to advance in your career, you need to be able to read a balance sheet so you can interpret relevant information for business decisions,” Koivula points out. Studying in the Aalto MBA and EMBA programs is much more practical than traditional studies at university. One of the cornerstones of both the MBA and EMBA are the in-class discussions. Your peers will provide you with incredible support and insights – both during your studies and after you have graduated. “You know that everyone else in your cohort has gone through the same rigid application process to get in. We do this to ensure everyone in the group has a great deal to offer their peers in conversations and group work,” Laukkanen says. “The programs give you lifelong friends. When you graduate with your MBA or EMBA degree, you will have a trusted group of peers, people you will be able to call at any point of your career if you need advice or support. The valuable network you create is an important consideration for many people who are contemplating whether they should participate in a program in Finland or abroad,” Koivula notes. Whichever program you think will suit you best, the MBA or EMBA, Aalto EE will offer you an outstanding education to enhance your career – providing you are accepted to the program. Read more about Aalto EE's degree programs.